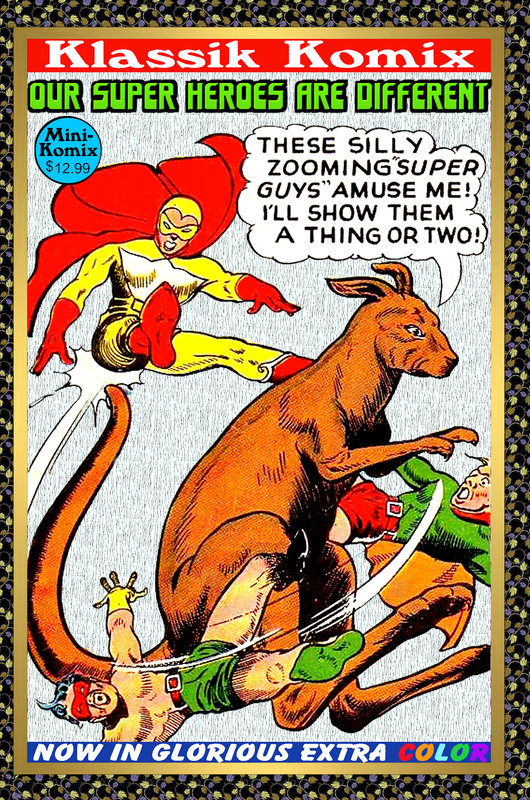 Klassik Komix digs into the obscure corners of the Golden Age to show how Our Super Heroes Are Different! The Great Zarro gains the ability to fly, young magician Jimmy Apollo summons the Magicmaster, mysterious Madame Strange confronts the villain known as The Octopus, Kangaroo Man and his sidekick Bingo jump some Nazis, Atlas gains strength from the Greek Gods, Kid Eternity meets the Amazons, ancient armor transforms an adventurer into the Glowing Gladiator, and the fearless Futuro kidnaps Hitler! 100 Big Pages of obscure superheroes! You can get this in print now at Lulu.